A standalone rabbit follower to accompany you on your adventures. Comes with tons of easy-to-install mesh and texture options. ATTENTION: This mod is offered as-is. I will not be updating it. Teyahven does not have any major issues, though he has some quirks (like lagging behind). These will not be addressed, though you may find they don't bother you. Meet Teyahven, a standalone rabbit follower. His name means Tale-Hunter-Wind in the dragon tongue, because why not? He doesn't fight (he is a rabbit after all), and is sometimes a bit slow, but he will gladly distract your enemies and is always cheery company to have around. Video by Brodual. Teyahven starts at 3:20. He comes with a variety of mesh and texture options, which can be installed easily via the scripted NMM installer. 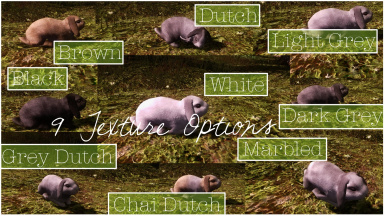 These options are standalone, meaning they will affect Teyahven only, giving him a unique look from other rabbits in your game. If you want other rabbits to use these meshes/textures, go here. Teyahven is dedicated to my rabbit Étoile, may he rest in peace. 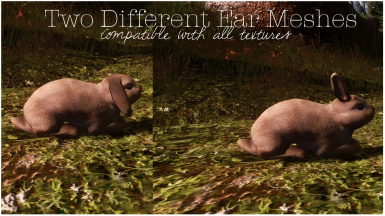 The main file comes as a black lop ear in his honor, but this can be changed with the options pack. A: Nope. Everything is included. Q: Where can I find him? Go to the bridge leading out of Riverwood. Do not cross the bridge, but walk along the bank of the river away from town. He may be hiding in the grass or tough to spot depending on what mods you have installed. He will also return to this location if dismissed. Q: He won't speak to me. A: Speak to him, save, and reload. This is a vanilla bug introduced by Bethesda. There's nothing I can do about it. Sorry. A: Everything! He is standalone, so other rabbit textures won't affect him. He also works fine with multiple follower mods. All credits go to the amazing KANRAx2, who kindly let me use her rabbit meshes and textures for this mod.